In late June 1944 British forces near Caen had the German under intense pressure. Striking deep into the German lines, the 15th Scottish division had found itself assaulted on both flanks of the salient. Now they in turn had launched their own counter-attack and taken back some of the ground recaptured by the Germans. Fresh from their last victory, the Jocks would be keen to drive the aggressive German panzer troops back even further and safeguard the Scottish corridor. This set the Germans up with a strong advantage. The German force could field nine machine guns to the British four, and they were all better guns, plus they had some powerful HE. The British would have to squeeze every ounce of value out of their artillery bombardment if their attack was to make headway. Pushing on from success in the last game, the Jocks are now trying to drive the Germans back to their start line. The last time to two forces had fought over this piece of ground, the Germans were the aggressors. This time British forces would be pushing in through the orchards and driving towards the open fields at the German end of the table. The Ground in between is marked by rural buildings and a main road with substantial hedges bordering the fields. These hedges block line of sight, making this a short-range knife fight. The British focus in the patrol phase was to get decent jump-off points into the orchards on the right flank of the British advance. Their left was dominated by open fields that were overlooked by a nearby farmhouse, so would be hazardous to cross. Both forces rolled for force morale with a -1 penalty due to the mens’ opinion, and both managed to score a very respectable morale of 10. Any chance of success for the British lay with them capitalising on the shock from their arty barrage. If they could get up onto a German JOP and shut it down before it was occupied they could deal the defenders a blow. However, the Germans had wisely sited their JOPs so that they mutually supported each other, and even if one fell they would be able to make the attackers pay for it. Not wanting to waste any time, the Highlanders quickly deployed two sections with the platoon sergeant and 2″ mortar. The closest German JOP was located in a ruined farmhouse, so one section went into overwatch while the 2″ mortar began lobbing smoke towards it, while the other section doubled across the field next to the house (aided by a double phase). The Germans were keen to responding quickly, but it must have been an almighty stonk because absolutely nobody was keen to deploy, Phil rolling an incredible string of fails on a 4+. Meanwhile, the Jocks were closing in on the farm building and were now just on the other side of a hedge next to it. Finally some of the Germans managed to crawl out of their foxholes, the first into action being the well-drilled crew of the infantry gun. Bringing their gun up to a firing position behind a hedge only about 60m from the Jocks they punched a 75mm HE round into the British section. No casualties resulted, but they’d definitely announced their presence. The British had been caught with their Bren in the wrong position, so the rifle team returned fire at the infantry gun while the Bren team tried to move down the hedge to the other end of their section’s position. Unfortunately for them the Germans rolled a double phase, and before the Bren could get into position the infantry gun fired twice more and was joined by and infantry squad deploying (finally). The sudden out pour of firepower from the Germans tore through the Highlanders, inflicting several casualties and pinning the section. With their Bren out of position and their firepower down to half they stood no chance of winning the firefight, and the British attack instantly ran out of momentum. Meanwhile the German squad holding the ruined farmhouse had managed to clear the caved-in entrance to the cellar they’d been sheltering in, and belatedly took up their defensive positions in the building. They were still the main target of the British attack, and the Highlanders sent in another section to try and get the attack moving again. This time they would infiltrate up the main road and attack the farmhouse through its main gates. The 2″ mortar had done a good job of screening the building, so the Germans defending it had no targets, but neither did the British section covering it from across the road. With their comrades getting pounded by the infantry gun, the British platoon sergeant decided to take the men covering the farmhouse forward to try and get onto the gun’s flank and silence it. The section facing the infantry gun and two MG42s was taking a real pounding. They were too isolated and facing too much firepower to do anything about, best bet was to avoid rallying off any shock and hope they broke before they took too many casualties. At least if they broke it would move them back from being pinned at the hedge, and they would be safe. Sure enough, they soon took several kills and enough shock to break them, and they fell back to the wooden barn to their rear to lick their wounds. Meanwhile the other two British sections had moved up the road and were now camped outside the gates to the farmhouse. The Germans took this opportunity to end the turn, clearing all the smoke blanketing the farmhouse and opening up their fields of fire should the Highlanders decide to rush it. This turn end caused the broken section to rout, and British force morale dipped to 7. Despite losing one of their sections there was still plenty of fight left in the Jocks, and they brought up another section into the position covering the house, while the 2″ mortar tried to restore some of the smokescreen, but its aim seemed to be off and it started throwing smoke all over the place. In slightly brighter news for the British their lead section had now reached the edge of the hedge that the le.IG18 was using for cover, and putting a quick burst into the gun crew managed to hit a man, the first German casualty so far. The gun crew however didn’t panic, and wheeled their gun to face to the new threat, tucking themselves in behind the gun shield and chambering a fresh round. If the Bren crew thought they had got the upper hand by flanking the gun like that, they were about to get a rude shock. Unseen to their right in the fields, a strong force of Germans lay in wait, and with the British lined up in the road ready to assault the farmhouse they had a perfect shot. A full squad and the tripod MG42 opened up, all three guns tearing into the Bren team who lacked any cover. An attempted interrupt from the 2″ mortar missed and plonked its protective smoke uselessly off to the side. Joined by fire from the infantry gun the German MGs quickly shredded the small team, causing several casualties, including two wounds on the corporal, killing him. This cut British force morale down another two points, putting them on five to the Germans’ ten. Crucially it also pinned that section. This meant that they would not be able to get out of the line of fire, and would simply be cut to pieces losing more men dead before breaking and further reducing British morale. Without cover, the British unit quickly gets shot up. The British attack was in big trouble. Their victory conditions required their force morale to stay above three, meaning they only had three points in the bag, while the Germans were still more than happy on ten. Only two British sections were still in the fight. 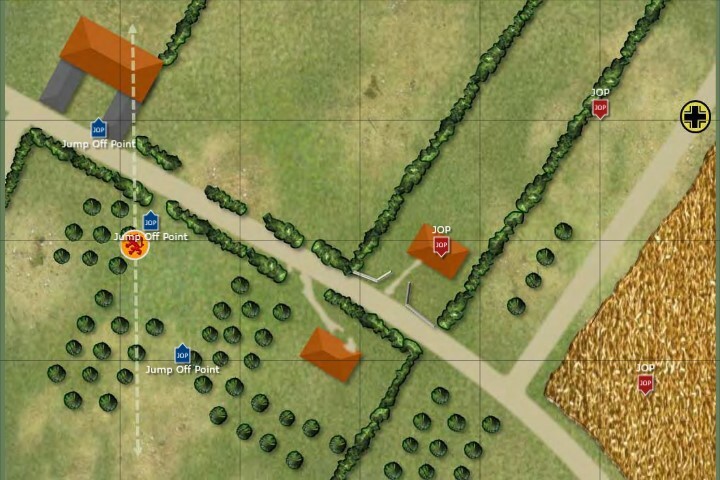 The German defensive line consisted of a squad and the infantry gun on one flank, a squad with the SFMG on the other, and a squad in the farmhouse linking both positions. Realistically the British only had enough effective troops left to maybe equal one of these positions, and no way of isolating them from each other. It was hopeless. Reluctantly the British lieutenant signalled the withdrawal, their counter-attack was over and the Germans had regained the initiative. In the retreat the pinned section got split up, and one man remained missing while two were captured by the Germans. Four men were dead, including an NCO, with three more badly wounded. This put total British losses at seven men, a pretty poor showing considering the net effect on the German platoon was zilch. The Germans had finished the game with a five point morale advantage, more than enough to negate the two men taken off the table during the game. All is not well in the British camp, and they’d started this game at -2 CO’s opinion, and an alarming -8 on the men’s opinion. The CO’s opinion dropped to -3, which would cut into their already meagre support allowance. The men were unhappy at the beating they’d taken, but surprisingly not that bothered about losing an NCO, but their opinion still dipped to -9. This severely reduces the effectiveness of the platoon commander, and earned the man a carpet parade in front of the company CO. Their force morale now rolls with a -2 penalty. The German CO was pleased but not overjoyed, while the men were happy to have so easily rebuffed the British without even taking any casualties, so their opinion rose one point to -2. This removes their force morale penalty and they’ve earned an extra support point next game. Overall things are going badly for the British. Already at a pretty big disadvantage in the early scenarios of this campaign they’re now racking up more penalties, while the Germans are getting stronger. You’ve really got to move very fast if you want to exploit the effect of a pre-game barrage. Phil rolled incredibly badly for deployment (failing the first seven rolls!) and I still couldn’t get to his JOP in time, despite using 3d6 moves. I had considered using a vehicle to rush the JOP, but I only had five support points and it was difficult to justify blowing them on such a big roll of the dice. Smoke works both ways. It stops the bad guys shooting at you, but it also stops you softening their position up before an assault. I hesitated to assault the full-strength squad in the farmhouse as there’s no way one of my sections could have beaten them in close combat, and in the meantime the rest of their boys shot my platoon to pieces. Sometimes the campaigns throw up some really tough scenarios. In this case the German platoon was much stronger, and also had much more support. That’s obviously quite an unbalanced game, and looking back I probably should have felt a lot less optimistic going into it. Realistically the chance of the winning was pretty slim, perhaps I should have limited myself to trying to make a stinging attack and then withdrawing instead of trying to actually take and hold the table. Intersting Report, the cumulative effect of the Men’s Opinion really becomes difficult to overcome as the campaign progresses. Thanks Andy for the AAR, thoroughly enjoyed reading, poor Brits overcome by the dreaded German firepower. Often the way. I’m sure the righteousness of their cause will allow them to achieve final victory over the evil fascists. God knows it isn’t going to be my generalship!